Paradise Roller Girls’ Honey Badgers shared the aloha and traded blows with four other teams March 2-4 at the Wild West Showdown outside of Seattle. After finding out they were accepted into the Showdown just six weeks before the date the Paradise Roller Girls launched into action and held a flurry of fundraisers to raise enough to send the team of 16 skaters, two coaches and two referees to Seattle. The Big Island community and fans from abroad rose to the occasion and through their generous support helped Paradise Roller Girls exceed the $10,000 goal and allow the Honey Badgers to participate in the premier roller derby event. The Honey Badgers skated in four bouts over the three day Showdown. 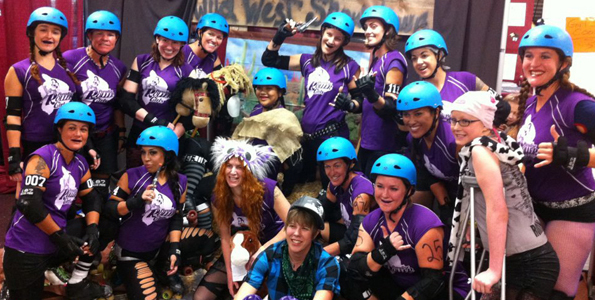 Though they did not bring home a victory, Paradise Roller Girls certainly won the hearts of all in attendance. The Honey Badgers turned in an even performance over their four bouts and were regarded as some of the hardest hitters at the event. The first bout was against Sin City Roller Girls, final score 221-64. The following day the Honey Badgers faced the Slaughter County Roller Vixens, followed by the Bellingham Roller Betties (final score 201-84). For the final day of the Showdown the Honey Badgers bouted against Humboldt Roller Derby for an end score of Humboldt 203-72. During the first half of PRG’s final bout the teams were holding even until Humboldt took a commanding lead before the half-time buzzer. Spirits flagging, the Honey Badgers went to the bench for half-time. With 10 minutes before second half, Honey Badger and hula dancer Destinee “Big Daddy’s Addiction” Pakani brought the team to their feet for an impromptu half-time hula on skates. Facing the crowd, the whole team began to dance to the intense delight of the audience. The spectators in the bleachers and balcony were cheering so loudly that the bout in-progress on the neighboring track stopped in the middle of play to skate around the barrier and watch. The Honey Badgers were cheered on for all four days by “Roarin Lauren” Selden and her family. Lauren is PRG’s brave Big Island Babe who was diagnosed with an aggressive form of bone cancer shortly after her 11th birthday. Leaving their home on the Big Island, the Selden family moved to the Pacific Northwest where Lauren is receiving treatment at the Seattle Children’s Hospital. As part of their visit Paradise Roller Girls donated $2,500 to the Selden family to help with medical costs. The Seattle roller derby teams have rallied around her family as well, holding benefit bouts and fundraising events. Throughout the Showdown “Roarin’ Lauren!” was a rallying cry for the Honey Badgers. The Paradise Roller Girls are looking forward to hosting their Showdown opponents on the Big Island in the future. All four teams plus two others want to travel to Hawaii for another opportunity to play the Honey Badgers. The Paradise Roller Girls are set to start the official season June 23 with the debut of their four home teams – the Hilo Bay Bruisers, Volcano Vixens, Mauna Killahz and Kona’s Tsunami Slammers in a double header at the Hilo Civic. The girls will warm up with a pre-season scrimmage May 5 at the Old Kona Airport Park complex.